Sleek and charming knitted dress, made of pink cotton jersey and navy rayon knit, adorned with two cute navy woven dots appliques, each sprinkled with small white polka dots, and finished with a riffled navy skirt. With its unique charming design, made of skin-soft and super-comfortable Made in America jersey, Vella is sure to become your all-time favorite that will get you noticed! Match mom in Laura, or coordinate with sisters and best friends in Little Laura, Cherine, Carita, Brigite or Amy and you will be a star at the playground, at school and at any other occasion this season! We use highest quality fabrics. Our MADE IN AMERICA dresses have long-lasting value and our clients wear them happily for many years thanks to The Matching Dots (TMD) classic and adaptable design. 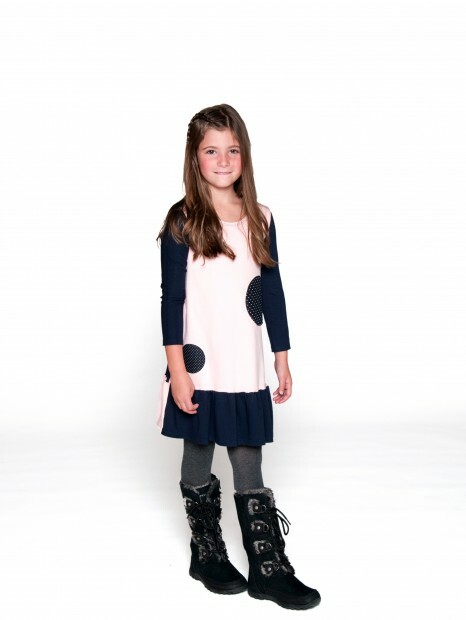 Moms tell us that their daughters love their TMD dresses – small girls grow beautifully in them from dress to tunic.